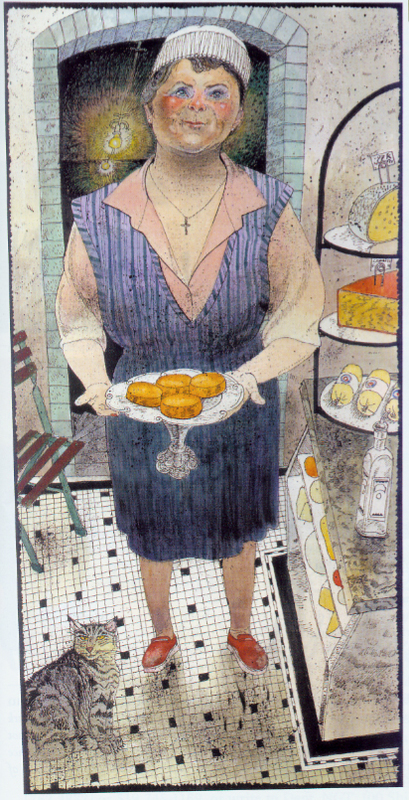 Madame Cantin is a high priestess in the religion of raw-milk cheeses, and she works hard to convert me, putting out a large tray of different raw cow and goat-milk cheeses, any one of which would be illegal to sell in the United States. It is a question for which I have no answer. I sample her cheeses. They are magnificent. She sees the look in my eyes and knows: I am a believer. Praise the lowly goat! Now—and only now—will she sell me the outrageously expensive Epoisses. When I ask her why I can’t just take it with me, she sighs, looks at me sadly, and says it is simply not possible. That is when she delivers the bombshell: “You know, of course, this cheese is illegal in your country,” she says. No, I tell her. I did not know. And then she sees the problem: I am a dupe. A rube. A cheese mule, as it were. I have been asked to carry nine ounces of an illegal substance, something I know nothing about. So her mission is clear. If I am to go through with this, first I must learn what I’m dealing with. Before she will sell me the Epoisses, she insists on giving me a crash course in French cheesemaking (most of which I have already revealed to you). Madame Cantin puts on a smart laboratory smock and leads me down some dark stairs at the rear of her shop to the cellar. Here she has two dark rooms full of stinky raw-milk cheeses. One room for goat cheese, another room for cow cheese. We enter the goat cheese room. There are hundreds—no, thousands—of little white slabs of cheese on trays stacked from floor to ceiling being aged to perfection. The Fort Knox of chèvre. For the next hour or so, I learn everything there is to know about curds and whey. I learn about rennet and mold and brine. 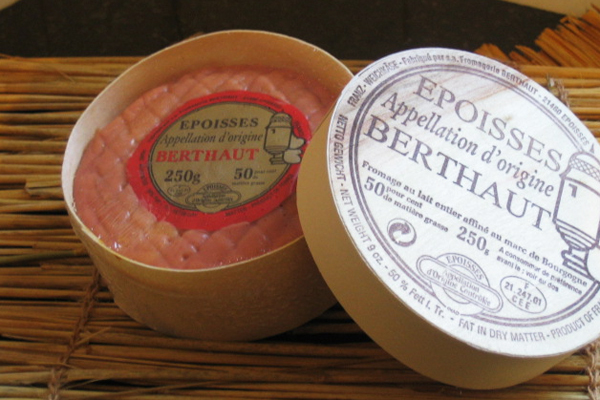 I learn about washed-rind cheeses, like Epoisses, which, as they ripen, are brushed with marc, a French alcohol. But mostly I learn about the joys of making cheese from unpasteurized milk. Marie-Anne Cantin’s fromagerie is inconspicuously tucked into a narrow little side street midway between the Eiffel Tower and Napoleon’s tomb. She is sharp, perky, greatly opinionated, and reminds me just a bit of Debbie Reynolds. Cantin is a second-generation fromager, having taken over the business from her father. I ask her if she has any Ay-pwoss, blowing out the second syllable as if getting rid of something nasty in my mouth, and she makes that same little raspberry noise that Diane made and leads me to one of her stunning little cheese displays where we stare, together, at four little creamy rounds that look like pumpkin-colored CDs. “Voilà!” says Madame Cantin, as if she had just produced photos of her grandchildren. She carefully lifts one up to my face. I smile and sniff. It is…odoriferous. Seeing my reaction, Madame Cantin gives me my first lesson in French cheese appreciation: “The worse the cheese smells,” she tells me, “the better it tastes.” Then she shrugs and adds, “This is a hard thing for Americans to understand.” What the hell. Since I’m not eating it, I don’t care. In France, many cheeses have a season. What the French call “la meilleure époque”—the best time to eat them. What determines the best time to eat a particular fresh cheese? It depends on two things: The pasturage of the animal that is providing the milk to make the cheese and the ideal amount of time necessary to age the cheese. Take a nice artisanal goat cheese like Pourly. These goats graze on grass from the limestone plateaus of Bourgogne. The most abundant, flavorful grass is the new growth in the spring. And the cheese takes only two to four weeks to properly age. So the best time to eat Pourly is late sprig to early summer. And if you are a true French cheese-geek, that is when you would buy it from your local fromager. But I do not know any of this yet because I have not met Marie-Anne Cantin who is going to tell me everything I don’t know about cheese before she allows me out of her shop with $60 worth of Epoisses. We shall meet her tomorrow. In France, where they make over 500 different cheeses, and a good Brie is as easy to find as a baguette, Epoisses is rather rare and expensive. But in the United States it is more than rare. It is unavailable. It is unavailable because it is as illegal as Cuban cigars. You see, this unassuming little round orange bundle, which weights about nine ounces and has something of a barnyard aroma to it, is made from unpasteurized milk. And in the good ol’ US of A, raw-milk cheeses are absolutely, positively forbidden unless they have been aged for at least 60 days, which would sort of be like saying you couldn’t sell fresh fish in a grocery store until it had been aged for at least two months. There is a good reason for this decree from the U.S. Food and Drug Administration. Bacteria that can cause diseases can be transmitted in raw milk. Nearly a century and a half ago, French microbiologist Louis Pasteur figured out a process to eliminate bacteria in wine by heating it. Later the process was applied to milk and came to be called, as every schoolkid knows, “pasteurization.” Before Pasteur’s process was applied, all cheese was made from raw milk. In France today only about half still is. But modern pasteurization, in which the milk is heated to 161° for 15 seconds, can give milk a “cooked” flavor. And the whole point of having fresh, raw-milk cheese, like Epoisses de Bourgogne, is so you taste the distinctive flavors that come from ripened, soft cheeses that have not had their rather pronounced (substitute smelly here if you want) aromas “cooked” away by pasteurization. But this is a no-no in the States.